Grand Prix Sacramento (along side Grand Prix Chiba) was the first event to highlight the new Core Set Magic 2019 in limited play and did it ever deliver. The set delivered plenty of iconic characters and creatures to the fold, and promises many arrays of different strategies. We saw Goblins, Angels, Demons and many more in the feature match area this weekend. As the weekend progressed we saw it all. The feature match area played host to every planeswalker, five-color control, mono-color aggro, and even mill decks! The feature match area had it all this weekend and the 1253 players here really put the set on display for the viewers looking at every card in great detail trying to find the best new combinations they could play with! You could tell the excitement was in the air as players were thrilled to show off their favorite new cards and the best cards in their decks all weekend long. My favorite of these new cards comes in at number 4. It's no surprise the Dragons are the real headliners of Core Set Magic 2019. Nicol Bolas, the Ravager was one of the most successful cards on the weekend and it was everywhere at the top tables. In sealed deck, players would heavily bias their decks and manabases to be able to cast the amazingly powerful card. In draft, I even saw (23) Alexander Hayne hate draft a Nicol Bolas, the Ravager to prevent his opponent's at the table from having a shot to cast it against him. But Nicol Bolas, the Ravager wasn't the only one out in full force. We saw plenty of players around the draft tables on Sunday playing their favorite dragons. 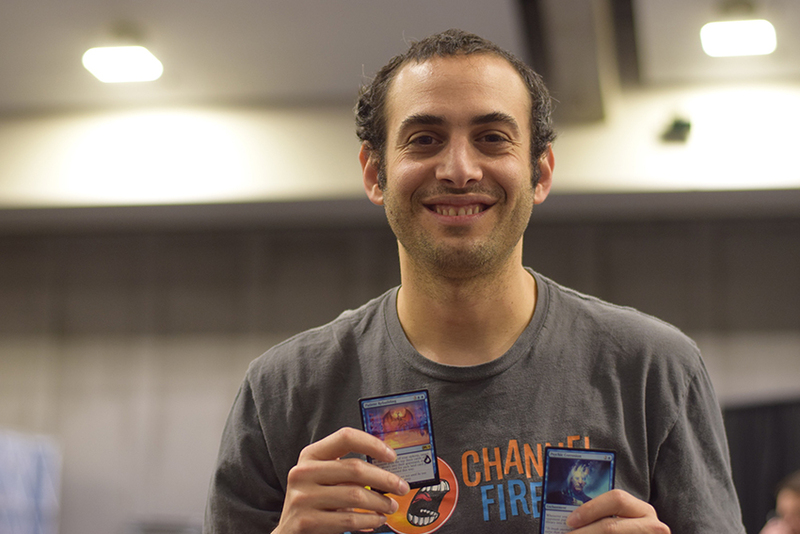 Josh Utter-Leyton had a deck with two copies of Arcades, the Strategist in his Bant midrange deck. Palladia-More, the Ruiner could be found ruining the opponent's day by being the most difficult to fight dragon. Vaevictis Asmadi, the Dire nearly pushed Pro Tour Hour of Devestation semi-finalist Yam Wing Chun into our top 8. And Chromium, the Mutable was a shooting star coming into play and decimating the opponent's battlefield by devouring their best creature each time it hit the battlefield. The Elder Dragons are here to stay. These mythic rares are among the best cards in Core Set Magic 2019 and they showed off their learned skills over years in the multiverse! (22) Ben Stark is the cream of the crop when it comes to Magic talent. The Hall of Famer's limited prowess is nearly unmatched and he showed more of his impressive skills this weekend. Ben is known for learning how to draft a format and draft it well. With learning how to draft a new set like Core Set Magic 2019, you end up learning a few tricks. Sometimes, those tricks show themselves is really special and surprising decks. In his first draft of the weekend, Ben managed to put together a mono blue deck that was designed to run the opponent's out of cards in their libraries. He managed to win the first two matches with his deck, before falling in the finals of his first draft to a stellar white-red aggro deck, but he opened the eyes of many players here this weekend. Ben managed to identify which cards were going to be under-drafted and how he could use that to his advantage, learning which cards were more defensive and how he could make a usually “Off the wall” strategy, a reality. You can check out his deck and some of his thought processes here! Making Day 2 of a Grand Prix is an accomplishment. For a limited Grand Prix, after round eight you need to have won six of your first eight matches, no easy task, of which only 239 players manage to complete. After that, to come back on Sunday and win six straight matches in a new draft format is a real feat. Victor Reyes, Shengling Hu, and Marcus Luong were the three players that manage to do that this weekend. Reyes and Hu ended up with twelve wins for their efforts, but Marcus Luong managed to reach the top eight and had one of the best decks I've ever seen this weekend. 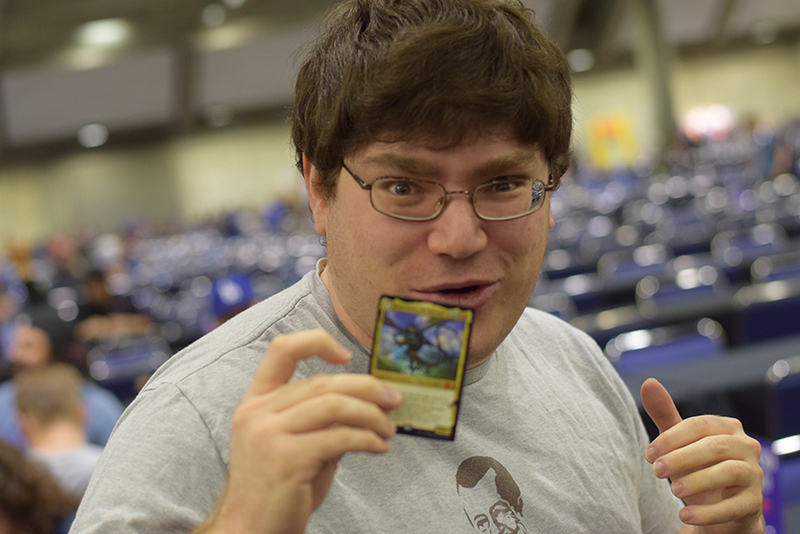 His top eight deck had three copies of Volley Veteran, plenty of Goblins, and Goblin Trashmaster to pump them all up! If you're looking to play some Core Set Magic 2019 limited, I wrote a break down of what these top drafter were doing this weekend, you can find that here. Making the top 8 of a Grand Prix is an incredibly special moment. Players are calling their loved ones, their friends, and extremely ecstatic, as they're going to get to play in the Pro Tour. But there's still more left to play for. Two players, John Walski and Richard Liu in their first Grand Prix top 8s managed to make it all the way to that lonely table. Just them, and a shot at the trophy in their first attempt. Richard Liu began the day as the tournament leader. He first draft deck was the talk of the room as his White-Black life gain deck featuring three Regal Bloodlords gave opponent's fits. After Vivien Reid joined his team in the second draft, Richard earned his slot in the top 8. Richard came into the weekend having never done a Core Set Magic 2019 draft. “I can't believe I almost didn't play the Grand Prix." He navigated his top 8 draft excellently finding his way to a second copy of the White-Black life gain deck, and during his top 8 run, he won close game after close game involving single points of life on each side! When the dust settled he found himself the last player standing, dropping only a single game in the top 8 on the way to the championship. Congratulations to your Grand Prix Sacramento Champion Richard Liu!